This was made for my dad’s birthday. It is a recipe that I’ve used before, but previously it was only used in a large batch of cupcakes. 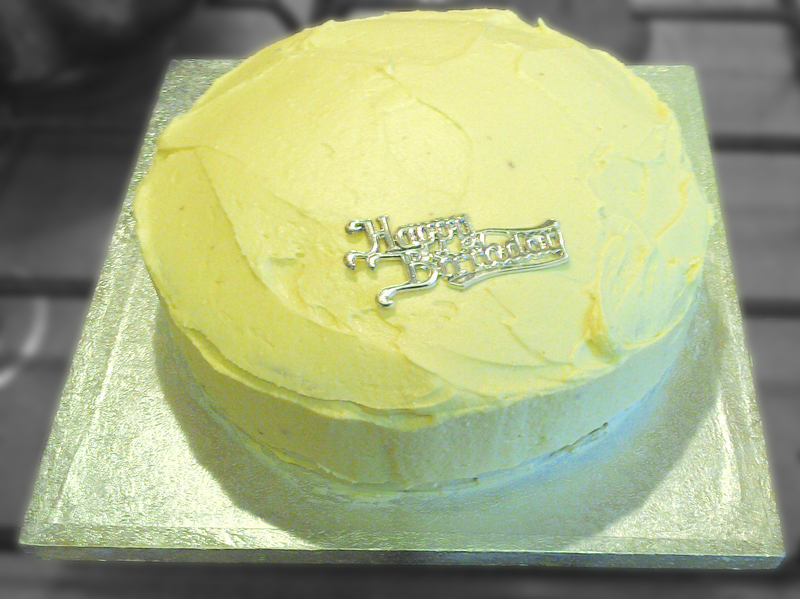 The larger cake, however, has turned out wonderfully. 1. Preheat the oven to 180C (160C for fan assisted ovens) and grease 2x20cm baking tins. 2. Cream the sugar and butter together in a large mixing bowl. 3. Add the eggs, one at a time, ensuring that each is fully blended before adding the next. 4. Add the coffee (I used 4 tsp coffee to 50ml boiling water) and mix throroughly. 5. Sieve the flour in, holding the sieve as high as possible to allow a lot of air to join the mixture. 6. Spoon the mixture evenly into the two greased baking tins. 7. Bake in the oven for approx. 40 minutes (or until cooked). A trick I have learned here is not to open the oven door until at least 30 minutes in to the cooking time. This ensures a thorough cooking right the way through the cake without disturbing it too much. 8. Allow the cakes to cool in the tin for approx. 5-10 minutes before turning out on to a cooling wire. 1. Cream the butter in a mixing bowl. 2. Add the icing sugar gradually. I took 7 ‘helpings’. Ensure each ‘helping’ is mixed thoroughly before adding the next part. 3. Add the Bailey’s (don’t forget to pour a glass for yourself!). 1. On one of the cakes, cover the top with some frosting. 2. Add the second cake on top. 3. Use the rest of the Bailey’s butter frosting to completely cover the cake.